She was born Ada Beatrice Queen Victoria Louise Virginia Smith to a former slave in West Virginia. Ada “Bricktop” Smith (1894-1984) had a face full of freckles and shocking red hair, hence her nickname. A mixed race bisexual, she was equal parts cabaret entertainer, club operator and matriarch of Montmartre, though she simply called herself “a barkeeper.” Her nightclub became the most popular in Paris for a fashionable set of celebrities, writers and royals. By 1930 Bricktop’s cabaret was the main attraction in Montmartre for a chic international coterie, drawing songwriters Cole Porter and Noel Coward, writers F. Scott Fitzgerald and John Steinbeck, and the Prince of Wales. Fats Waller and Duke Ellington stopped by on their visits to Paris and Louis Armstrong once sang a duet with Django Reinhardt. Bricktop’s was the “Moveable Feast” that was Paris between the wars celebrated in literature by Ernest Hemingway. Like Le Grand Duc before it, Bricktop’s played a central role in the black community of Montmartre. Musicians hung out and jammed until early morning hours, black entertainers could receive and send mail, catch-up on gossip or find jobs. And get a down home meal of fried chicken, cooked greens and cornbread. 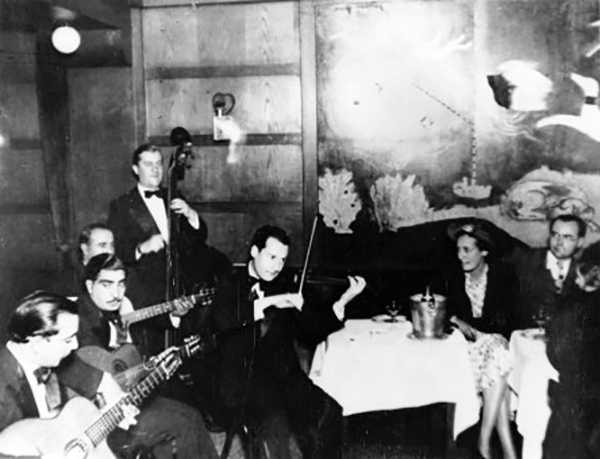 Bricktop’s was the first nightclub to headline the string jazz of Django Reinhardt, Stephane Grappelli and the Quintet of the Hot Club of France. Django is far left. 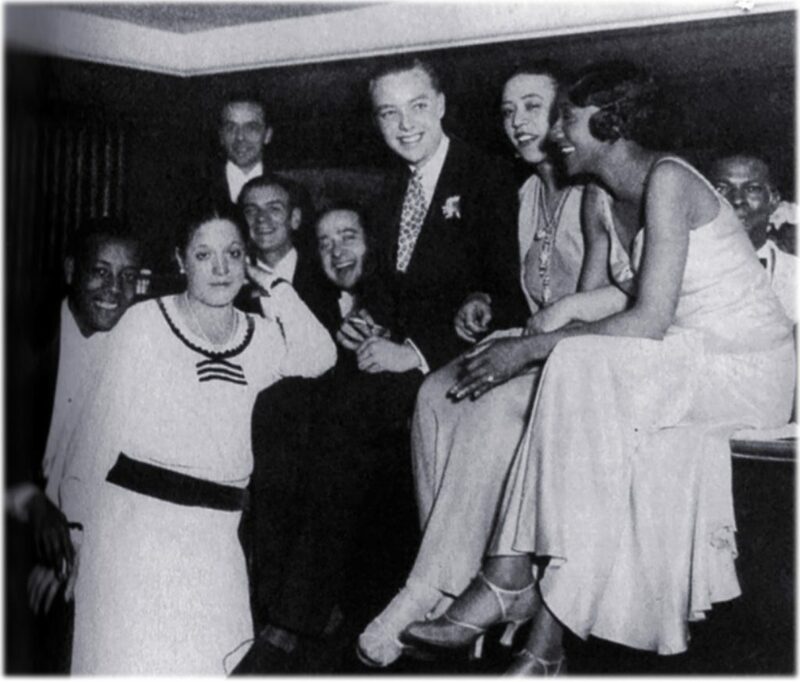 Bricktop’s cabaret and the nightclubs of Montmartre were the hub of activity for African-American entertainers in Paris — focal point and support system for the small yet cohesive community that hosted African American in France. An informally organized African-American colony welcomed black musicians, entertainers and even boxers to Harlem-on-the-Seine where they could become noted celebrities. 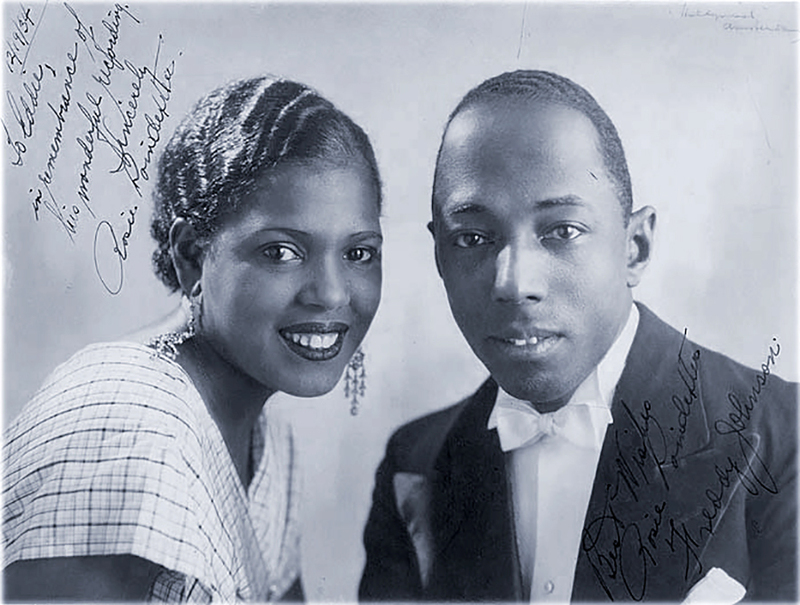 Piano player and bandleader Freddie Johnson with West Indies singer Rosie Poindexter, 1934. Photo: JazzIndex.ch. Freddy Johnson (1904-61) was house pianist at Bricktop’s for a few years, as were the excellent swing piano players Garland Wilson and Herman Chittison. An intimate Johnson duet with trumpet player Arthur Briggs, “Japanese Sandman” represents the muted, often hushed music offered at Bricktop’s. A very good musician and singer, Johnson came to Europe with bandleader Sam Wooding in 1928. He stayed, becoming quite successful as a piano soloist and bandleader. Freddy enjoyed great popularity in France, Belgium and Holland, recording with visiting American tenor saxophone master Coleman Hawkins. 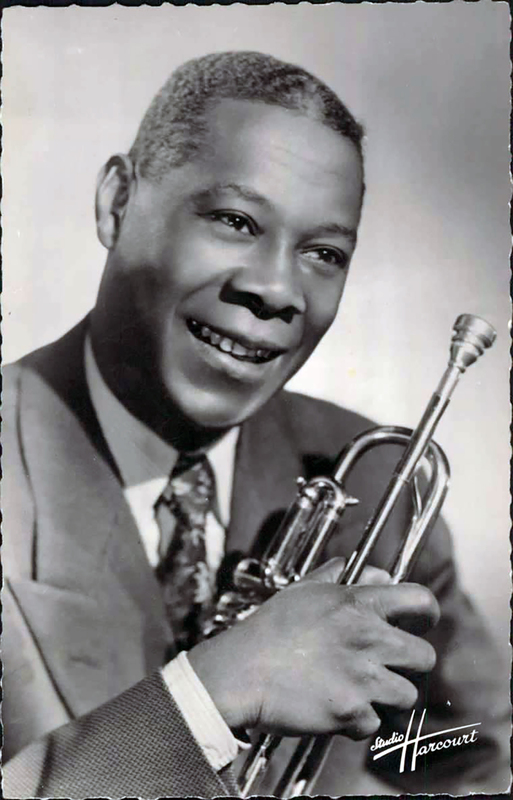 Johnson also ran a hot jazz orchestra with the fine trumpet player Arthur Briggs (1899-1991). Briggs was Grenadian-born, of Canadian citizenship and a graduate of the music education offered in the orchestras of the famed Jenkins Orphanage of South Carolina. Living continuously in Europe after 1920, Briggs led or co-led bands, mostly in Paris during the early 1930s and was loosely associated with Johnson. He too, recorded with saxist Hawkins. 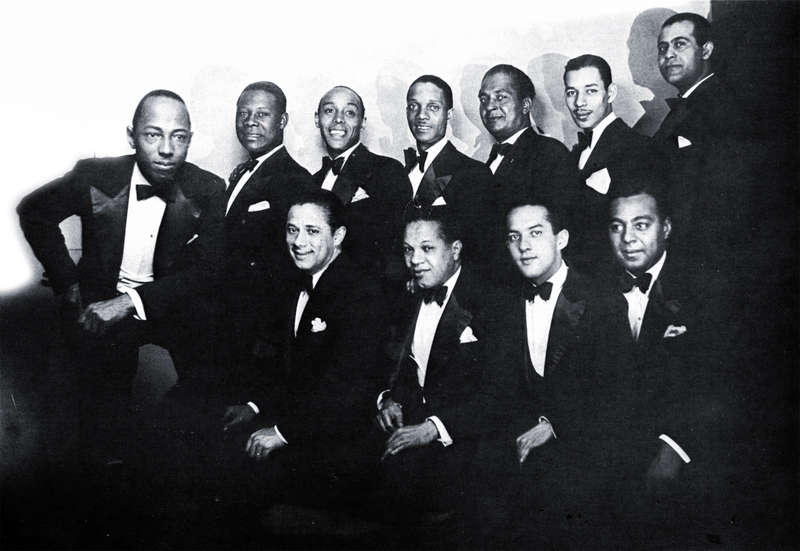 The Johnson-Briggs Orchestra, 1932, standing left: Freddy Johnson and Arthur Briggs, top right: reed player Frank “Big Boy” Goudie. For a while they shared leadership of a Harlem-style band containing the cream of American jazz musicians in Paris, the hard-swinging Johnson-Briggs Orchestra (aka The Harlemites). The 1933 “Harlem Bound” composed by Johnson was among the finest jazz records made by American musicians in Europe between the wars. The elegant Alberta Hunter (1895-1984) was a salty Blues, Cabaret and Theatrical performer who led a complicated bisexual lifestyle. Her storied career stretched from the dives and brothels of black vaudeville to the London staging of “Showboat” with Paul Robeson. A pioneering early blues singer, she’d recorded for a half dozen top record labels. Hunter wrote “Downhearted Blues,” Bessie Smith’s first big hit that sold a million records. Performing frequently in Paris, Hunter was part of the regular crowd at Bricktop’s and the nightclubs of Montmartre. In fact, it’s possible she and Bricktop were intimate. Which is ironic since it was Bricktop who had intercepted the 1924 telegram offering Hunter a job at Le Grand Duc, but taken it herself. At Bricktops Cabaret. Bricktop is front left, Alberta Hunter far right. Cole Porter’s ironic and bittersweet “Miss Otis Regrets (She’s Unable to Lunch Today)” reflects Bricktop’ distinctive personal cabaret singing style. It’s a cleverly constructed cry against racism and lynching. She never recorded it, nor do we have records of Bricktop in her prime. But Alberta Hunter’s 1934 performance borrowed some of her style. Yet in the cabaret, unlike this London studio session, Bricktop would have been accompanied by only by a few instruments, piano, or nothing at all. She sang while wandering between tables, interacting with her clientele and staff, or conducting other business. When the 1929 stock market collapse emptied the pockets of the idle American and British rich in France, Montmartre nightlife fell off. The decline was hastened by the spread of street crime and protests from out-of-work French musicians. The negative side effects of allowing a thriving jazz district eventually provoked a strong reaction from formerly tolerant Parisians. But by then, top African American singers, orchestras and entertainers were finding more prestigious work outside Montmartre, elsewhere in Paris, on the French Riviera or in Monte Carlo. There were posh gigs in Belgium, Holland, Portugal, Spain and Germany. Yet it’s doubtful that the jazz heard between the wars in Europe would have been possible without the fearless, bawdy, talented, outrageous and fabulous divas of Harlem-on-the-Seine. 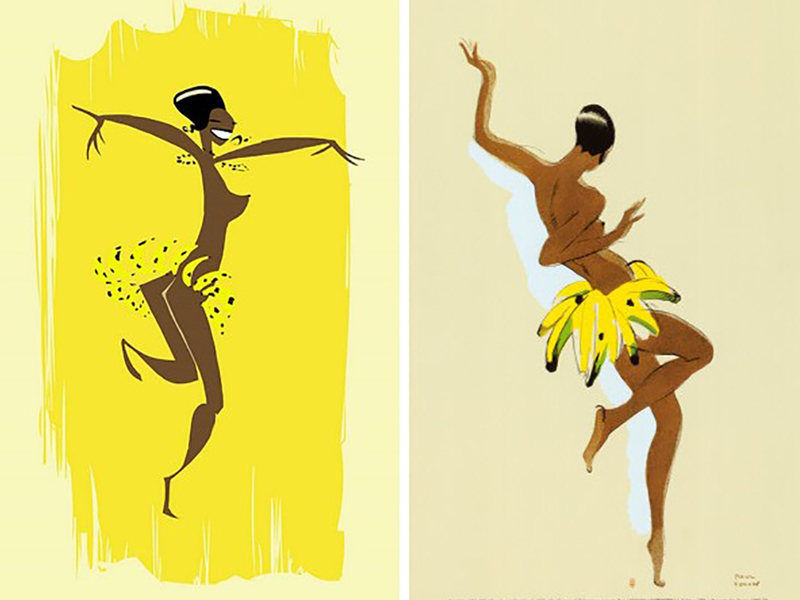 They launched “Le Tumulte Noir” and sustained a Golden Age of European Jazz and Swing, 1924-39. 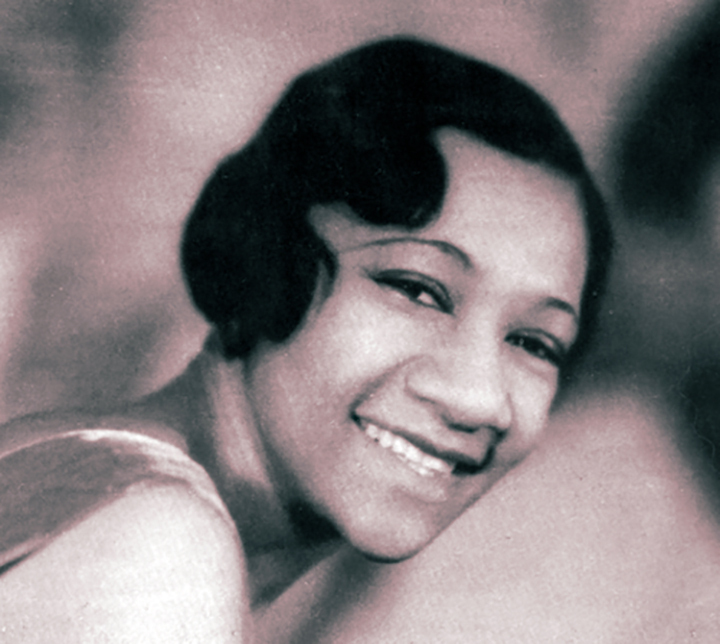 In Part 2, we’ll visit more of the cabarets and nightclubs of Harlem-on-the-Seine where jazz flourished in the 1920s and ‘30s and meet the trumpeter, singer and dancer Valaida Snow who led a flamboyant life in Paris and Europe. Chilton, John, Sidney Bechet: The Wizard of Jazz, University of Michigan Press, 1996 . Flannery, Janet, Paris Was Yesterday: 1925-1939, Viking Press, 1972. Dan Vernhettes, Christine Goudie, Tony Baldwin, BIG BOY: The Life and Times of Frank Goudie, Jazzedit, France, 2015.